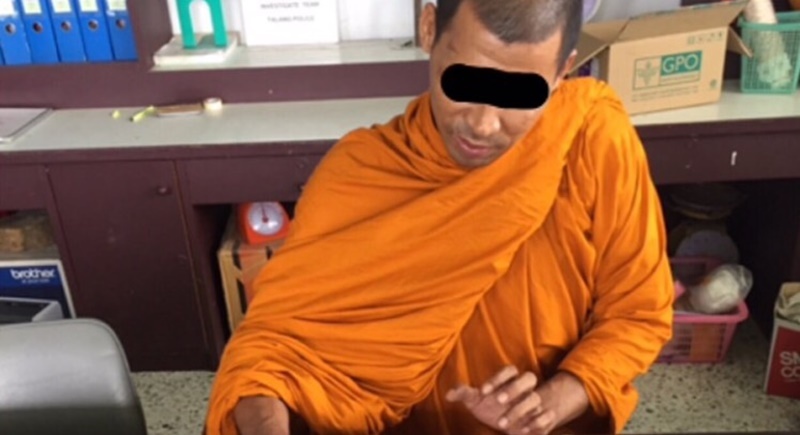 PHUKET: Thalang Police have arrested a monk who is suspected of murdering a monk’s assistant at Wat Ban Don (Thepkrasattri Temple) in Thalang early on Saturday morning. The arrested man has previously been jailed for drug crimes and murder. A Myanmar teenager who for the past year served as a temple assistant in central Phuket was slain in an attack on temple grounds in the early hours of Saturday morning (Aug 5). Thalang Deputy Cheif of Suppression Lt Col Amnouy Kraiwutthianan told The Phuket News yesterday (Aug 6), “We have now found a suspect who we believe killed monk assistant Mr Wei. “Thalang Deputy Chief of Investigation Lt Col Nathaphop Phongsapan and Inspector of Investigation Lt Col Phongphan Siriphattharanukul together with Phuket Provincial Deputy Chief of Investigation Police Lt Col Patak Khwanna questioned all the monk at the temple and found that Phra Khitthisak or Mr Khitthisak Songkram, 38, remained silent. He also looked drunk so police conducted a urinate test for drugs and found it was positive. “Phra Khitthisak has now been disrobed and has been charged with taking drugs,” he said. “We have also discovered that Khitthisak has previously been jailed for drug taking and murder. After being released from jail he continued taking drugs and was sent back to prison again. After being released again his relatives took him to the temple to become a monk,” Lt Col Amnouy explained. “Despite becoming a monk Khitthisak continued to take a lot of drugs. Sometimes he suffered hallucinations and he was afraid that somebody wanted to kill him. “The room where Khitthisak used to live was very close to where the body of Mr Wei was found. “However, we have to wait for the results of Khitthisak’s finger prints to see if they match with finger prints found on the knife used to kill Mr Wei. If the finger prints match then Khitthisak will immediately be charged with murder,” he added.